On August 28, 1941 the SS units arrived for the second time. This time it was my mother who fell into their hands. I managed to escape and hid in a wooden shed. I remained all alone with no parents or brothers. Towards the end of June rumors began to spread that they would soon kill all the people in the camp. 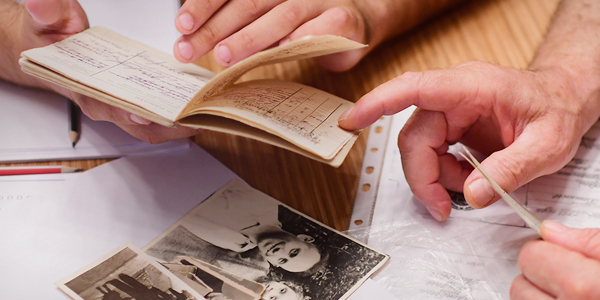 In the night of June 23, 1943, I escaped from the camp with another family. We went to the house of one of their former neighbors, and he hid us in a "bunker". I didn't know him, but it is due to him that I am here today to tell the story. His name was Anton Sukhinsky. He was a bachelor and lived alone in a small and very poor house. He had dug a basement under the house where he hid me and another family of four – Yitzhak Zeiger, his wife Sonia and their two sons, Munio and Milek….With us was another young girl, aged 16-17, Zipora Stock, today Shindelheim…. We remained under Anton Sukhinsky's care from the night of 23 June 1943 until July 1944….At the beginning we were in the bunker. But the neighbors soon discovered our existence. They would come every night and threaten us and ask for money. One day Yitzhak Zeiger decided to refuse to give them money. He explained that at any rate they weren't intending to let us live. One night in October they came with guns to the bunker and killed an old woman that was also with us. I was slightly wounded. We managed to escape thanks to Anton's intervention….We wandered the entire night until daylight. After we had walked some six kilometers we were received by some people who let us into their barn, gave us warm milk. We remained there shaking with cold for 24 hours. We continued to wander until we decided to return to Anton's place. The night was terribly dark and cold. Our feet stumbled on the stones and sank in frozen water; our clothes were soaked and stuck to our bodies. We finally managed to reach Anton's home without being seen. It was a joyful moment when we reached his home. He received us warmly, opened his arms, crying with joy and kissing us. He whispered into our ears so that no one could hear: "Dears, I am so happy that you came to me. From now on I will not permit anyone to harass you. From now on no one will be able to discover you.". And he acted accordingly. He put us temporarily in the attic, and for the next three nights, with the help of Mr. Zeiger, he dug a new hole….The size of this bunker was 2.50 X 1.20 X 0.80 meters. We were six in this space and we could only sit or lie. There was only one little kerosene lamp. We were happy to be under his care, but for Anton this presented a terrible burden, and he was alone to bear it with his angelic patience, his deep love for human beings and his determination to save our lives. They were looking for us again because people had seen us wandering about before our return. They searched from house to house, and since we were not found they assumed that we had returned to Anton. First the Ukrainians came looking for us. They threatened Anton but God prevented them from discovering us. This was not the end. The SS came and held a gun to his chest and ordered him to denounce the Jews. But he stood firm. They searched, screamed, and again God wanted us to live. From our hiding place we could hear everything, and in fear of death we asked God to save us. On 24 July 1944, following heavy bombardments, the Germans were forced to withdraw and the Russians entered Zborow. I remember the moment when Anton opened the trapdoor of the bunker. Our blood froze because we thought the Germans had discovered us. But he had come to tell us with his soft voice that was full of joy: "Come out. You have been saved. The Russians are here."